Defiant Heart by Marty Steere has been on my to read list for a while which I have been trying to whittle down this summer. It was an easy read (I read it in just a few days) with likeable characters. I've mentioned before that most of the historical fiction I read are set in during the World War II era. Defiant Heart is a World War II book, but isn't really. It's a romance, but isn't really. What is really is, is a coming of age story. Jon Meyer is orphaned after a terrible car accident kills his parents and brother. He is sent to live with his only living relative - a grandmother he's never met. In an Indiana small town, the reader get a glimpse of what life was like leading up to America's entrance into WWII. Congressional elections are coming up, uncertainty in Europe looms, and Jon must find his place in a new home, town and school. If you have ever moved to a small town where everyone has known each other since they were in diapers, you know how difficult it can be to fit in - any difference is exploited by the "in crowd". Unfortunately for Jon his difference is a cause for division around the globe. The plot is pretty much your standard boy meets girl story line. There wasn't too many surprises and it was pretty predictable. But what I really enjoyed was seeing what life was like for Jews in America leading up to the US involvement in WWII. 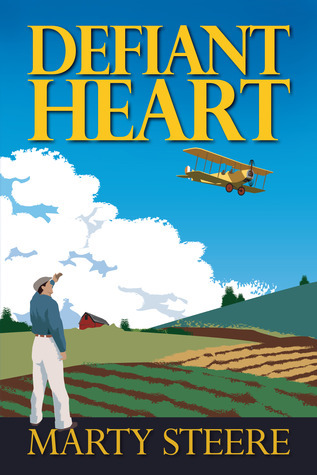 Also, most of the books I've read set during WWII focus on the infantry, but in Defiant Heart the Air Force is featured. If you like historical coming of age stories with a bit of romance, then I recommend picking up a copy of Defiant Heart (there's a giveaway at Goodreads through July 18). Girl Who Reads is an Amazon advertising affiliate; a small fee is earned when purchases are made at Amazon through the link above. A free ebook was provided by the source mentioned above in exchange for an honest review. Opinions are my own.